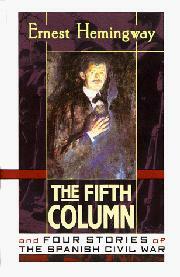 Four previously uncollected short stories set in the dust and heat of the Spanish Civil War plus an out of print play, "The Fifth Column," written during Hemingway's tour in 1937-39--the stories an opportune reminder of Hemingway's astonishing skill in the days before his precision gave way to Papa's Great Posture. In "The Denunciation," a savage and ironic gallantry edges a man's betrayal of another as a spy. "The Butterfly and the Tank" is a delicate round-about of various perceptions, tragicomic as is the central event dealing with a shooting in a bar. "Night Before the Battle" is core Hemingway--the last hours of a doomed soldier talking, talking out his long night. "Under the Ridge" projects the dark rigors of a world of men and war and one soldier's withdrawal into a defensive hatred. . . .